The Screaming Trees were a band from Seattle—they broke up in 1999. 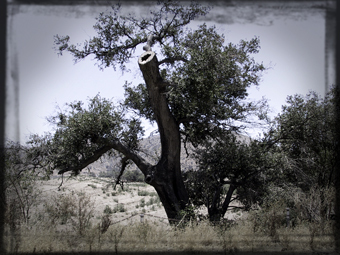 But the original screaming tree is still going strong, or at least this is what legend tells us. last moments of her life at the foot of this gnarled trunk. This looks like the perfect place for a killing; homes are few and far between, and rusting cars share yardspace with trash and makeshift lean-tos in most of the roadside dwellings. More well-to-do residents up on the ridgeline are surrounded by orchards and fences to keep the riff-raff out. A dry creek bed slaloms through the rock-strewn valley, providing water for horses and cattle in the springtime, and tsunami-like flash floods after a good rain. An area resident cornered in the local Circle K who refused to be identified gave conflicting directions and warnings about crazies with shotguns and bad attitudes. “All the trees are haunted around here!” she laughed. “You must be looking for the meth lab.” She claimed to have a great view of the mountainside from her place across the valley, and hinted at all sorts of nefarious activity seen from her backyard. Asked if the Screaming Tree legend might have evolved to keep the curious away, she returned the question. “Are you a cop?” “No, but I’m starting to see a pattern here,” I said. “I only wish the police would get out here and clean up this place,” she smiled as she plunked down cash for her cigarettes. The mysterious lady coughed, smiled a goodbye, and walked on down the road. Local legend, or a Scooby Doo-like coverup to hide a redneck speed factory? The answers lie with the intrepid explorer or the San Diego Sheriff’s Department.